This week we are hosting our lovely friend Isabel. After following her for a while on instagram, we got the chance to meet her in person during one of her travels to London. Then we caught up with her again during Playtime Paris. Isabel was very kind to spare some time and talk to us when we ask her to share some of her moments. This week we would like to introduce you this inspiring and multitasking Mum (@isabel_mjj). Can you please tell us about yourself? Who is Isabel and what are her ambitions in life? I am really just a normal woman, haha! I love where I am in life now, to be honest. I have a great job and an amazing little family and the best friends and look forward to everything the future has in store for me. I just take it as it comes. I know you are so multi-talented mum, you are a teacher, a blogger, stylist from time to time, full time mum and wife, how do you juggle all them? Can you please spill the beans? Well, like I said before, I just take things as they come and try not to stress about it all. Take one day at a time. I also make a lot of lists... To do lists are my life saver and it feels so good to check things off, ha! It is not always easy to have a lot of quality time with family and friends, but I rather spend time with my loved ones than do the laundry. Good thing we have enough clothes so I don't have to do this every week :) And I love love love my cleaning lady, I'd be lost without her. How would you describe your style, anything you say that Isabel never wears or buy for her home? I am a huge fan of simplicity. Keep things simple, right? For myself I buy good basics that last longer than one season and the same goes for my kids, I guess. I will never buy big chunky slippers and let alone wear them. Plastic on our feet, no thanks. What about your shopping habits? How do you shop? I always buy the same things really. Jeans, shirts, a dress from time to time and I mostly shop online. That saves me time and I don't have to drag my littles with me. I rather spend our free time doing things they love too, like a bike ride and a picnic or have coffee or brunch with friends while the kids play together. Any book, movie that inspires you and that you would like to recommend to us? My all-time favourite book is "The Words" by Jean Paul Sartre. I have a major in Ethics and Philosophy and that book was really important to me while I was at college. I read it in French as I don't really like translations that much, because a lot of meaning gets lost. My favourite movie would be BREAKFAST AT TIFFANY'S and THE FIVE PENNIES. Both old movies I know by heart. I watched them over and over as a kid and teenager and when I watch them now it warms my heart with memories. What are your choices for Jeanne from Kokori’s collection? 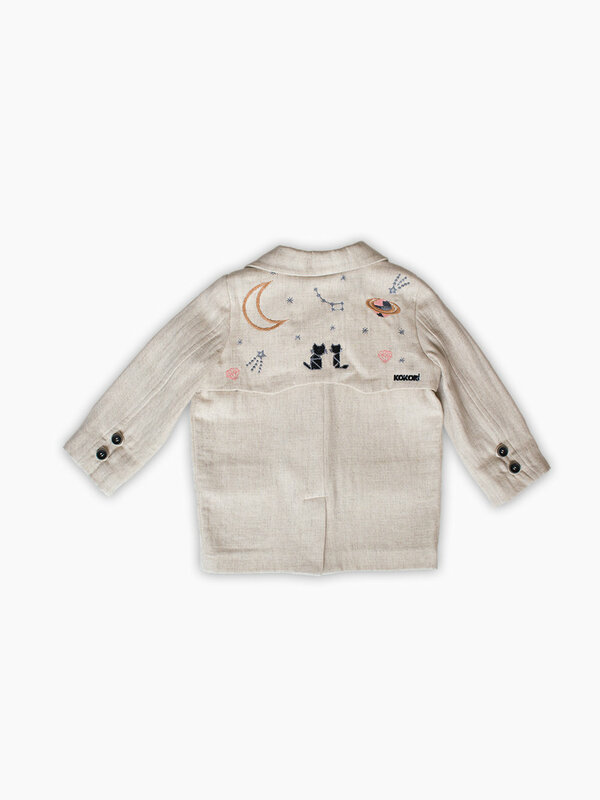 The linen coat (moon jacket) must be my favourite. Together with the pink skirt and sparkly top. 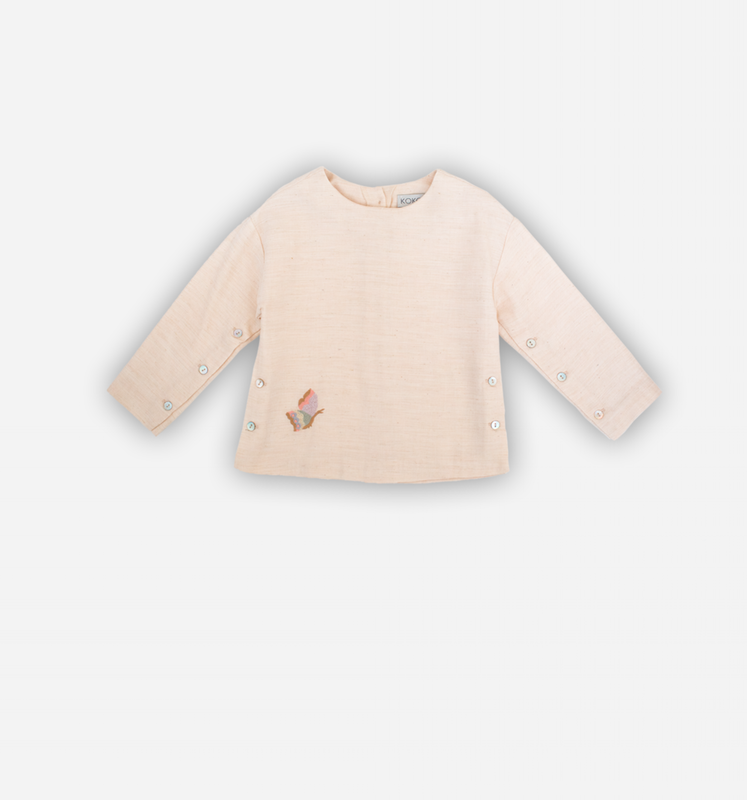 So classy, but still playful for a little girl. It really suits her, don't you think?